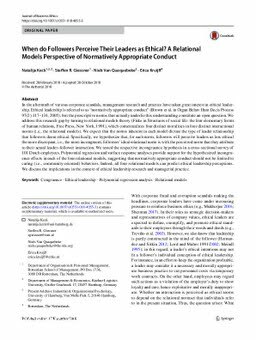 RePub, Erasmus University Repository: When do Followers Perceive Their Leaders as Ethical? When do Followers Perceive Their Leaders as Ethical? In the aftermath of various corporate scandals, management research and practice have taken great interest in ethical leadership. Ethical leadership is referred to as “normatively appropriate conduct” (Brown et al. in Organ Behav Hum Decis Process 97(2):117–134, 2005), but the prescriptive norms that actually underlie this understanding constitute an open question. We address this research gap by turning to relational models theory (Fiske in Structures of social life: the four elementary forms of human relations, Free Press, New York, 1991), which contextualizes four distinct moralities in four distinct interactional norms (i.e., the relational models). We expect that the norms inherent in each model dictate the type of leader relationship that followers deem ethical. Specifically, we hypothesize that, for each norm, followers will perceive leaders as less ethical the more discrepant, i.e., the more incongruent, followers’ ideal relational norm is with the perceived norm that they attribute to their actual leader–follower interaction. We tested the respective incongruence hypothesis in a cross-sectional survey of 101 Dutch employees. Polynomial regression and surface response analyses provide support for the hypothesized incongruence effects in each of the four relational models, suggesting that normatively appropriate conduct should not be limited to caring (i.e., community-oriented) behaviors. Indeed, all four relational models can predict ethical leadership perceptions. We discuss the implications in the context of ethical leadership research and managerial practice.